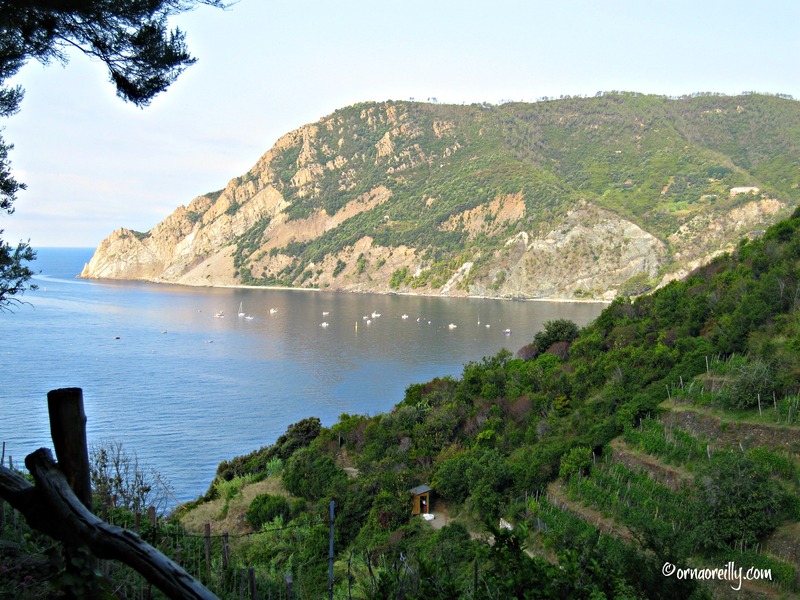 Walking in the Cinque Terre – I couldn’t wait. What to pack? My essentials consisted of my trusty walking shoes, loose cotton cut-off slacks and a few cool linen tops, plus a collapsible straw hat. Also, into the bag went a swimsuit, wrap, sandals and a few light cotton garments for lunchtime and evening wear. And, of course, several books. Arriving in Pisa, I hopped on the train to La Spezia, changing there to the local express for the Cinque Terre and beyond. 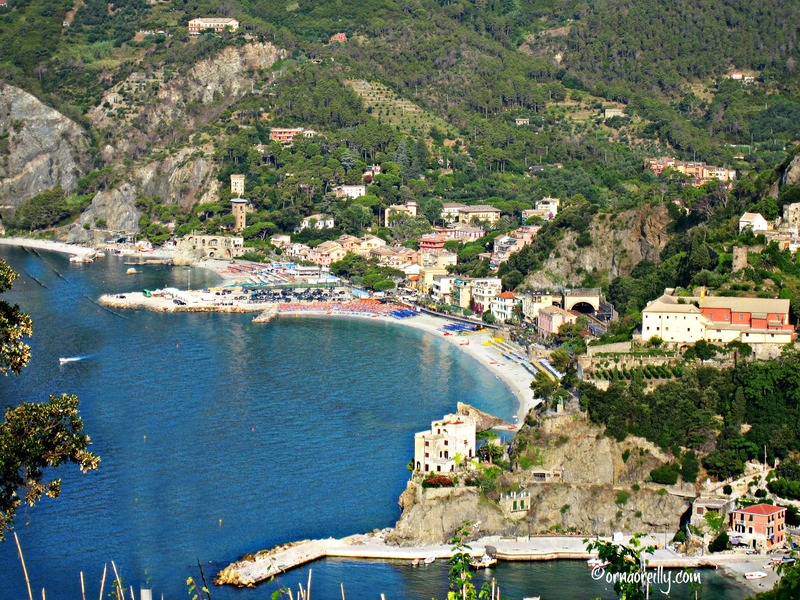 I had chosen Monterosso al Mare as my base for the two weeks I planned to stay in the Cinque Terre. It is the largest village of the five, accessible by car and with two large beaches. It has a year-round population of around 1,500, but this figure swells to unfathomable numbers in summertime. Monterosso, the furthest west of the five towns, is split in two with the new and old parts linked by a tunnel beneath the promontory of San Cristoforo. On the far side is the old town with its quaint narrow streets and second great beach. I stayed in the new part and wandered through the tunnel every evening for dinner. 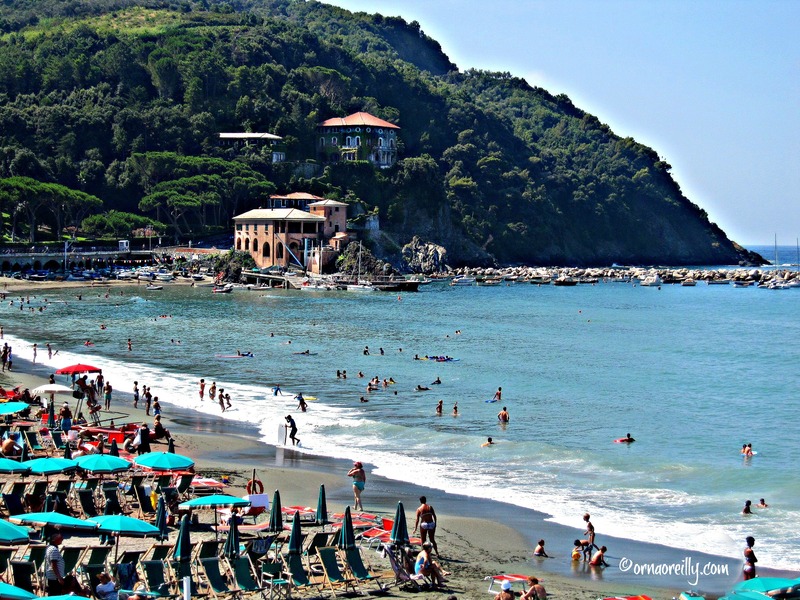 There are lots of small hotels, B&Bs, rental apartments and restaurants in Monterosso al Mare and the village has a unique holiday atmosphere. 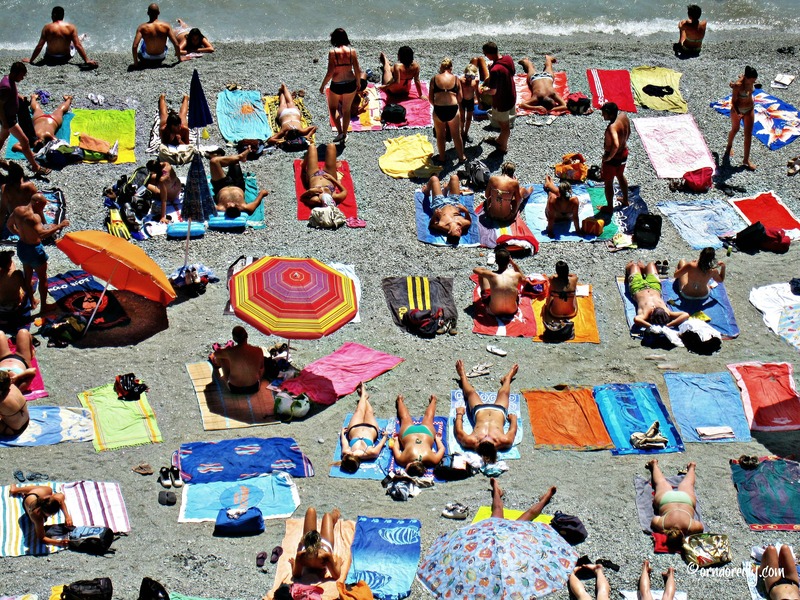 There are rental sun loungers and umbrellas on the beaches and excellent facilities with changing rooms and bars, where you can get a lunchtime panino and an ice cold beer. The pretty town is full of lemon trees and is also famous for its grapes, olives and white wine. There is a train station which ferries its passengers between the five towns and beyond. First stop Bonassola…. 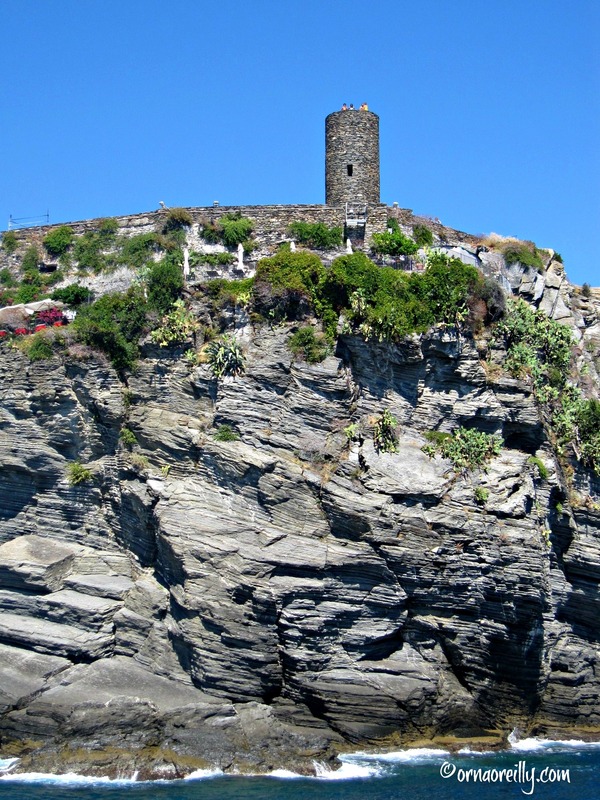 The other Cinque Terre villages are Vernazza, Corniglio, Manarola and Riomaggiore. I also took a boat trip along the coast. The high cliffs, dotted with houses here and there, were stunning. i wondered what it must be like to live on, what looks like, a fairly precarious location. I arrived in Portovenere, a very beautiful town, protected by UNESCO and beloved by Lord Byron, it is just down the coast and not part of the Cinque Terre. A perfect spot for a light lunch. Walking between these five villages is the real reason I was there. Let me take you along these wonderful trails. 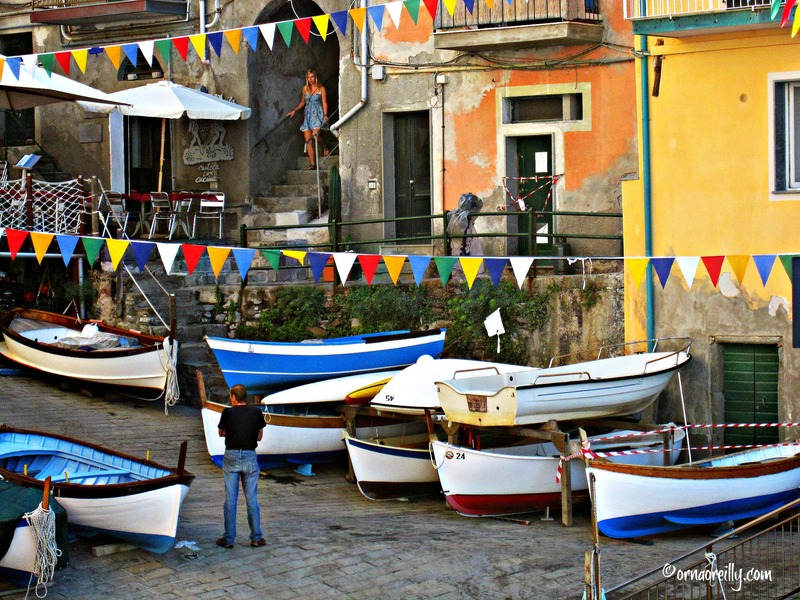 The first morning I walked from Monterosso to Vernazza. This was pretty steep and my heart almost stopped at the sight of the many drops, with very few railings in sight. But I soldiered on and, in fact, I did this walk on two separate occasions. 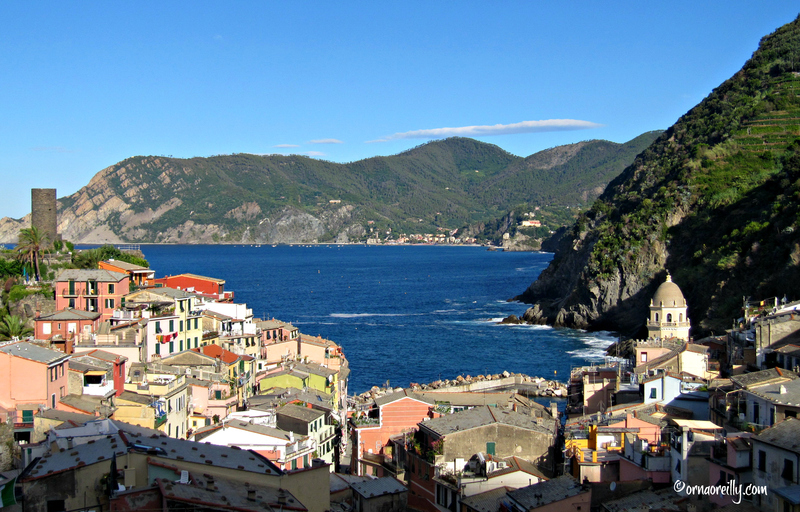 My next trip began by train when I travelled the short distance from Monterosso to Vernazza. 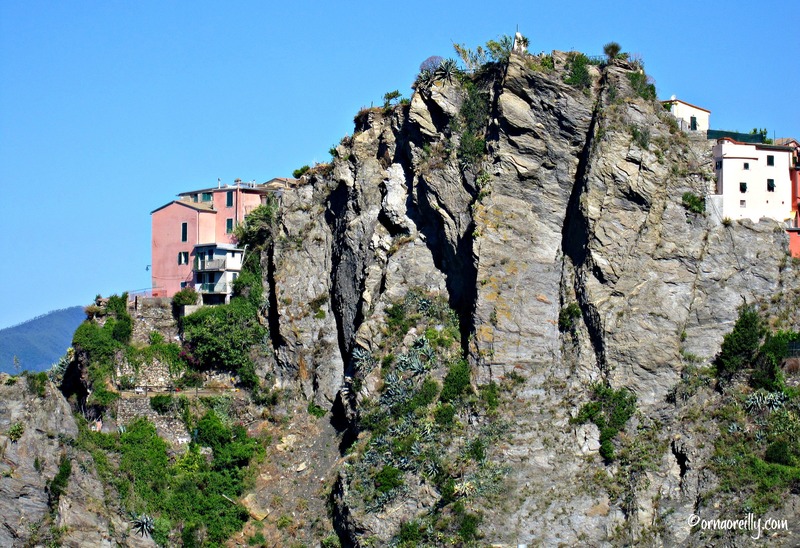 Here I began my walk to Corniglia, the smallest and highest of the villages of the Cinque Terre. I began my climb, looking back at pretty Vernazza. I followed this another morning, travelling to Corniglia by train, where I walked the much simpler route from there to Manarola. After that, I found the walk to Riomaggiore a mere stroll. It is only 500 metres from Manarola and can be done in sandals along the Via dell’Amore which is chock full of padlocks and romantic graffiti in its tunnels under the cliffs. 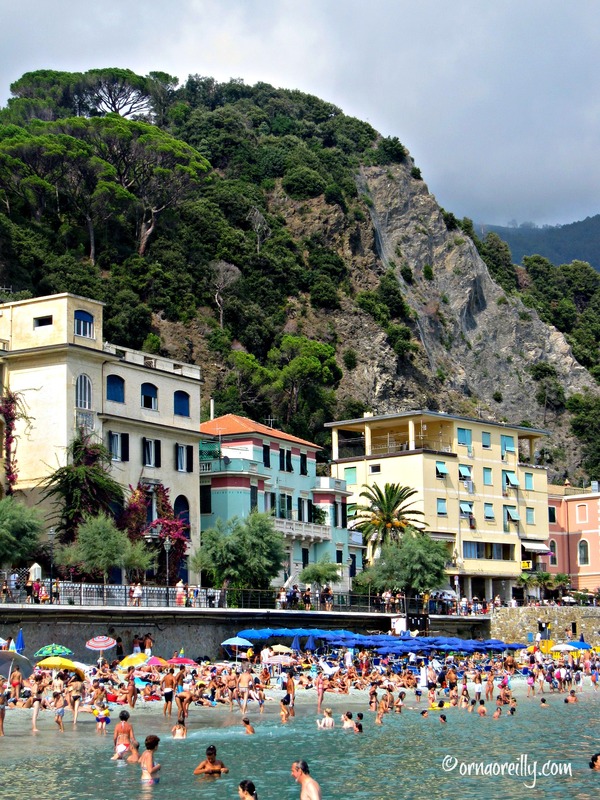 Daily, on returning to Monterosso from my various morning adventures on foot and by train, I headed to the beach, where I had hired a sun lounger and umbrella for the duration of my stay. I found that swimming in the sea at Monterosso was an absolute treat. Floating on my back in the warm waters of the Mediterranean Sea, while looking up at the mountains towering overhead, was wonderful. How to get there: Ryanair to Pisa. Then by train via La Spezia. 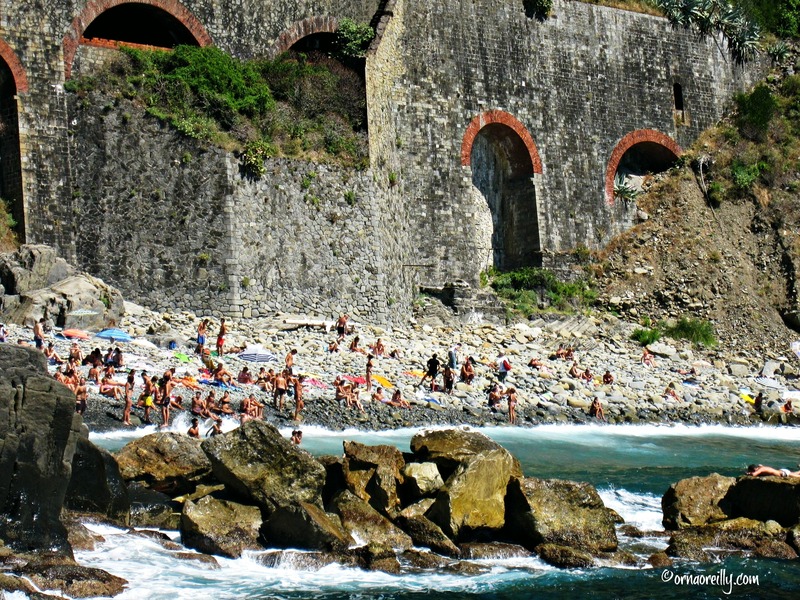 Takes me back to our visit to Cinque Terre and all the fun (some strenuous!) hikes. Thanks for sharing Orna! Thanks Jeff. This trip was a couple of years ago when I used to travel solo and I found some of the trails slightly hair-raising (heights!) but well worth the effort. The views are stupendous. Brings back great memories of when we visited in 2016. Unfortunately we were able to hike between villages due to rain (although we more than made of for that when we did the “Path of the God” trail at the Amalfi Coast) such a beautiful place. And you pictures are lovely. Thanks Orna! Thanks Martin. 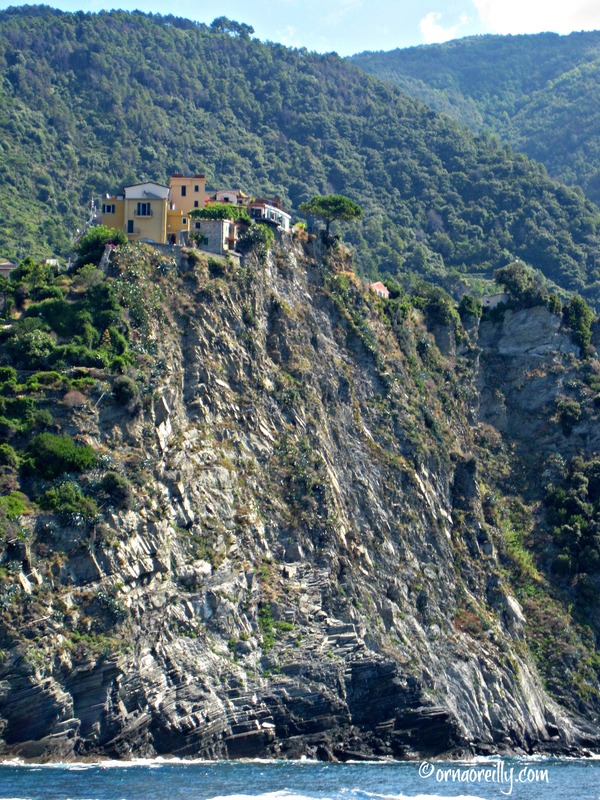 Pity you couldn’t hike on your visit to the Cinque Terre. I walked very early in the mornings, before the trails got too hot and crowded. It was a wonderful couple of weeks. Beautiful photos. Many years ago I visited a few of the towns by train and I remember glancing up a path that was way too narrow for my comfort, so lying in the water and looking up at the mountains sounds about my speed. Indeed Karen! 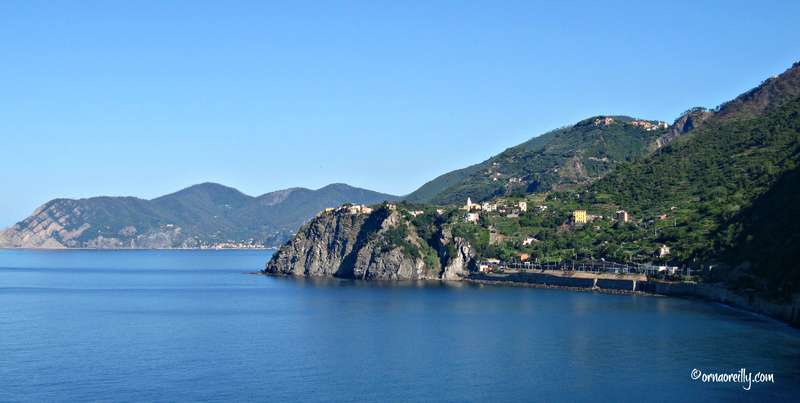 The trails are steep and narrow between Monterosso, Vernazza and Corniglia, but the views are so fantastic that they were well worth the effort. My reward was always a gelato, wherever I ended up, followed by a dip in the sea. A very relaxing holiday. Good story and lovely pictures as always. We went in 2006 – pre-flood and pre-cruise ships. We stayed in a B&B just east/south of Vernazza, reachable only on the sentiero azzurro – great fun. Actually leary of returning because of the crush of people one reads about these days. I believe the area has become very crowded at holiday time. I was there and a couple of years ago and, though the beaches were jam-packed, the trails were pretty peaceful early in the morning, before 10.00. We spent a week there last fall. We stayed in Monterosso as well. We hiked to Corniglia the first day. The second day from Corniglia to Riomaggiore. The simple hike from Corniglia to Manarola was closed so we had to take the long way straight up. It was challenging but so beautiful. We also spent a day in Portofino and Santa Margherita. It was all lovely, but as you said very crowded with tourists – mostly Americans. 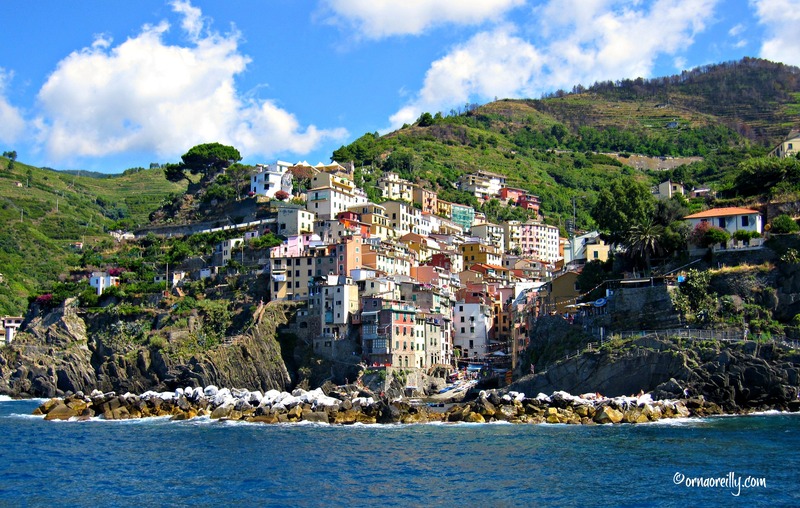 It appears that the Cinque Terre has been discovered. What a pity! But visitors need to know that there are many undiscovered and beautiful places here in Italy. So glad you enjoyed your visit. Great photo spread on the Cinque Terre complemented by an entertaining and informative narrative. Well done, you! Thanks Margie. It’s such a beautiful place. Almost a pity it has been ‘discovered’. It seems to be more crowded year by year. Hi Orna – such beautiful pictures and loved reading about your experience. We visited Cinqua Terra in May and loved it. Your description of the hike from Monterossa to Vernazzo was spot on. Strenuous but breath taking. Some of the paths are closed now. We walked a couple several years ago, but I found it much too hot and crowded. I like to take the boat between the villages. Yes, I believe some paths are closed due to mud slides. 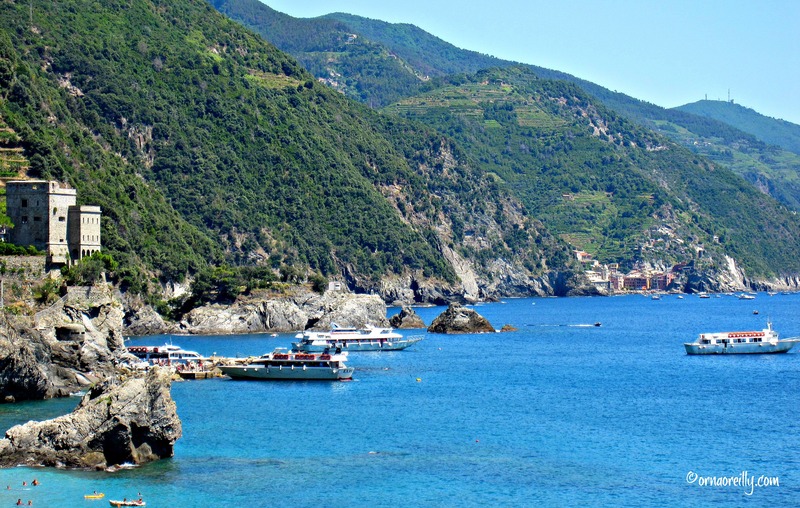 However, I walked very early when the paths were in the shade and most visitors still enjoying breakfast….so I usually had the paths between Monterosso – Vernazza – Corneglia more or less to myself. It was bliss. We’ll be there the second week of October. Hoping the summer crush is over and that the Med is still warm enough for a swim. We’re Canadian, so we can deal with “coldish” water. Thanks for the lovely descriptions and wonderful photos. I doubt very much that the Cinque Terre will be cold in October; not too sure about the water temperature! Enjoy your trip. Hopefully the summer crush will be over by then. I’m glad you enjoyed my blog.